April 9, 2015 Posted in current events. Over the last years, I’ve had to do take-backs on two activities I used to dismiss: boxing and motorsports. Getting a taste of each as a participant made me eat those words. I’ve been boxing for two years now and love it. But set that aside for another discussion. Today, I want to revisit my chance to live MotoGP for just 7 minutes–two laps on the back of a Honda CBR1000RR Superbike with AMA Pro Superbike champion Chris Ulrich at the Circuit of The Americas (COTA) racetrack. Me and champion Superbike rider Chris Ulrich (foreground), after two laps around the COTA track. David Swarts is at the bike. As editor in chief of a local fitness magazine, I was invited to take part in a media experience designed to promote interest in the upcoming MotoGP races. The idea behind the Geico Honda Two-Seat Superbike Ride Program was that, by put journalists (and fans) on the back of a bike driven by a professional, they’ll be more passionate about covering races. ** Since I don’t know how to drive a motorcycle and had wanted to experience the COTA track since watching the first Formula One American Grand Prix in 2012, this opportunity was just too good to pass up. 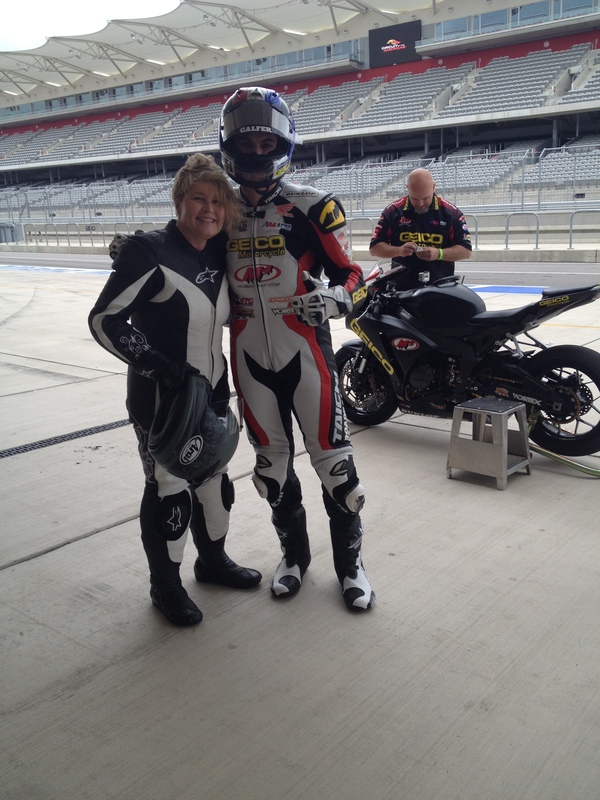 Chris Ulrich gets ready to take me around the COTA track as part of the GEICO Honda Two-Seater Superbike Ride Program. **This year, the program has a new sponsor in Suzuki, so it’s the GEICO Suzuki Two-Seat Superbike program. Also, Swarts let me know that the team is racing in the MotoAmerica AMA/FIM North American Road Racing Championship (more simply called the MotoAmerica Superbike Championship). This year, MotoGP starts tomorrow, April 10, and runs through Sunday, April 12. In addition to watching the races, fans can take part in demo rides provided by a variety of motorcycle manufacturers. These demo rides begin on Turn 19 (Yamaha, Suzuki, and Honda) and the Support Paddock (Victory, Harley Davidson) before traversing the back roads around COTA for 30 minutes. There’s a required pre-ride safety briefing, and participants must be at least 18 years of age and wear standard protective gear: DOT-approved helmet, eye protection, long-sleeved shirt or jacket, long pants, full-fingered gloves, and over-the-ankle protective footwear. Register onsite. Ticket information can be found at circuitoftheamericas.com or by calling the Circuit sales team at 512-655-6300 (tickets range from $39 to $139, depending on seat location and number of days attending).